I'll admit I'm quite fond of Company magazine. Ok, the endless word hybrids do my head in (up-dospiration? Really?) but I've always found it very accessible. I appreciate the way they explain how other women got their ultimate jobs, but without feeling the need to tell you how to please your man. Then there's the body image thing. 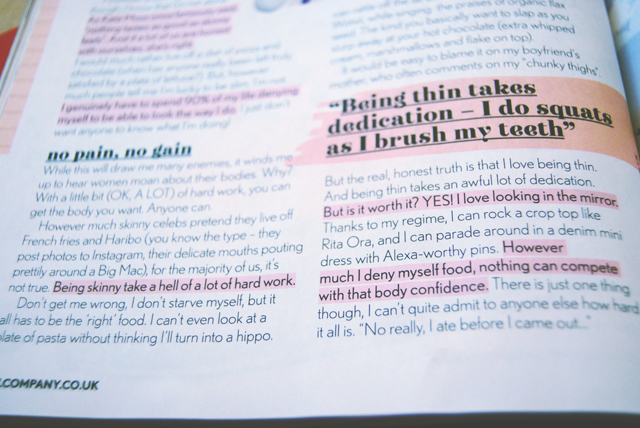 I'm going to be honest here- I'm not one of those girls who finds slim models and diet advice infuriating. I understand why slim models are used in the industry, and it does make sense, and I think that if you want to get fit or lose some extra weight, some exercise and diet tips are beneficial. Nevertheless, it was refreshing to have a magazine that didn't slap GET YOUR BIKINI BODY IN 14 DAYS across the cover. Then I came across this article: The First Rule of Skinny Club. I won't go into too many details but, suffice to say, it tells the tale of an anonymous writer who lies to her friends about eating before she came out to avoid cake and exercises obsessively. Ok, so it sounds like she has an eating disorder. Good on Company to raise this issue, right? Only it's not a sympathetic exposé on the truth of eating disorders in young women. It is, without any hint of irony, thinspiration. It ends with this paragraph. Are you freaking kidding me, Company? It's ok to deny yourself food, to exercise whilst brushing your teeth, to lie to your friends about your eating habits since you'll end up with a body like Rita Ora. It's worth it? Really? Don't even get me started on the title- Skinny Club. Like it's a cool clique that we all want to be a part of. The whole article makes this unhealthy obsession sound aspirational, glamorous and normal. It doesn't even mention the fact that these are the signs of an eating disorder. There will be young girls reading this article, who want to lose a bit of weight to look like Rita Ora or Alexa Chung, and think this sounds like the ideal solution. Here's a respectable magazine, telling them that it's all worth it to look like their icons, and since it makes no mention of it being a psychological illness, they won't realise that this is not ok. The article is giving young girls tips on how to develop an eating disorder, simultaneously assuring them that it is a great idea. Let me tell you. There is nothing glamorous or cool about eating disorders. About collapsing because you haven't swallowed anything but Diet Coke for 36 hours. About developing a severe kidney infection from dehydration. About growing white fuzzy hair all over your body. It is not cool. It is not normal. It is an illness and it can kill you. I can only hope that Company consider the articles they print more carefully in the future. They have a responsibility to the young women who read their magazine. Let's use that responsibility for good. Wow! I'm reading this with a slack jaw! I cannot believe that an actual magazine published this rubbish! I completely agree. To the point that I refused to read the article after I read the first paragraph. I normally love Company but it's really put me off reading it purely after this ignorant article they wrote! I haven't seen the issue yet (I do normally read Company but I haven't got around to buying the issue yet) but I would of been horrified to come across this. It is definitely an eating disorder, whenever food & lies are put together, it's a problem (much like the saying about alcoholics who lie about their alcohol consumption). 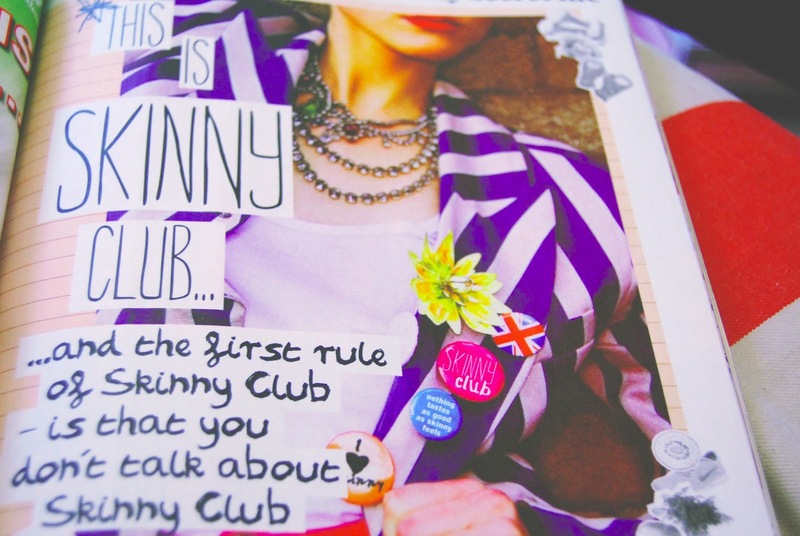 You're right about the title too, "Skinny Club" just sounds like it's promoting this way of life. There are some very influential youngsters out there! I think I'm more aware of this sort of things since having a daughter. Well done for speaking out, I think yourself & the other commenters have covered everything else I wanted to say! Wow, I'm shocked that in this day and age such a popular magazine like Company would put an article like that to print. You're right, young girls read this magazine, they don't need to have that slapped in front of them! I wish more magazines would promote being happy and healthy rather than being skinny or "bikini ready"! Being healthy is so much more important than starving yourself and exercising to death to be bikini ready in X amount of weeks! It's really irritating! Company doesn't seem to realise that it's not about eating. It's psychological. They're making a mental illness sound appealing. I read it the other day and I was SO angry. My friend however didn't see a problem and said "they were highlighting the issue". Sorry but that's not a hard breaking expose on eating disorders, that is a shallow "I feel so good when I am skinny" post. If they TRULY wanted to help, why didn't they print advice lines? Just because you are skinny does not automatically mean you are healthy and being perhaps a 10-12 doesn't mean you are obese. GRRR! The highest rise of mental health issues is young adults like this magzines target market. I haven't read it but would assume that there was no helplines provided for people who feel that theh need it. I feel that company havr lost their marbles over the past few months, taking no responsibility for their actions but rather laughing complaints off. They do not realise the influence they have on young minds. Company is my favourite magazine and I can't believe they did this. I didn't read the article because I'm in France right now and sadly I can't get it, but just by reading the last one I thought it was inspirational for overweighted girls to lose weight and not to give up. But if it's about girls that are already well fitted but think that eating disorder is the solution is so wrong ! I can't believe this. I am so angry at Company for publishing this- this is promoting eating disorders and telling people that being thin is the most important thing. "I can't even look at a plate of pasta without thinking I'll turn into a hippo" is clearly a sign of an eating disorder, as is lying about what you eat... This poor girl needs some serious professional help to change her attitudes towards food. Also, I'm laughing at the grammatical error- "being skinny take a hell of a lot of hard work"- surely that should be takes!? Wow. I was truly surprised to this this from a well respected magazine- that they made that sort of behaviour seem acceptable, desirable even, is TRULY worrying. Thank you for writing this open letter and highlighting the responsibility of the magazine. People are far more impressionable than they think! I like Company Magazine, but why do they keep getting it wrong with these ridiculous articles all the time! I know they meant well, but so many teen girls are going to take this post as something to aspire to and that's shocking. Being 'skinny' doesn't mean your are healthy, and it definitely does not make you prettier. This is shocking. I am so disappointed in Company. I hope they read this. They need to. Not cool Company. Not cool. Came across your post on Twitter and just had to read it. Weight is a very controversial issue especially in the fashion world. Writing an article like this will send the wrong messages to readers.As long as you're healthy it doesn't matter what size or shape you are. That's the bottom line. I wish more magazines and society would tap into this mentality. Thanks for writing this blog post. Will be subscribing to your blog. Came across your tweet on this blog post and just had to read it. Weight is a very controversial issue especially in fashion. The way the article was written will lead the wrong messages to readers. I believe that at the end of the day as long as you're healthy it doesn't matter what shape or size you are. I really enjoyed this article and will be subscribing to your blog. Hi Becky this post brilliant, I'm pleased you wrote it hopefully young girls will find it and realise starving isn't good for them. I used to live off 3 pancakes and an apple a day when I was 14 because I wasn't as skinny as all the celebs I looked up to, my life was miserable, yes I lost weight but I wasn't happy because I had no energy and it made my skin awful. I eventually started eating again after losing 3/4 stone and it was the hardest but best thing I ever did. The worst part is, magazines do that to people and you never grow out of that mind set, I still sometimes think to myself, oh I had lunch today I shouldn't eat anything for dinner incase I put too much weight back on. It's silly that we get so easily led and have ideas planted into our minds by the media. I think magazines definitely need to think more about what they publish in the future. i 100% agree with your post. The article in question is absolutely shocking. I purposely haven't bought this issue, because i saw the article whilst flicking through and it changed my mind. Let's hope Company magazine see this. I have never heard of this magazine before because I live in Germany and it's not sold here, but this makes me so incredibly angry! (and it is great that you wrote here about it). I had my struggles with eating disorders and this is exactly how you get started - you deny yourself food, lie to your friends and family about it and exercise secretly in the bathroom while brushing your teeth in the morning. Only a few months later you don't eat anything at all, you are an even better liar and you brush your teeth after you have thrown up because you ate 'too much' (like a slice of bread with bad, bad cheese). I will absolutely write a very angry mail to this magazine and I really hope that they will never ever publish something like this again. I'm not really one for reading magazines in general, and have never read Company, but this has definitely turned me off it even more. I mean really, that is ridiculous. I agree, they are basically condoning eating disorders and telling anyone who reads it (not just young girls but everyone) that you have to be skinny to be in the cool club. This is as bad as that Abercrombie and Fitch CEO comment. It's disgusting. I am so so glad I read this. It totally needed to be said. I read it this morning, was appalled by the article and mid-way through writing my own response, but you've put it far more eloquently than I ever could! It's just another example of a magazine going way, WAY too far in their quest to court controversy in order to provoke an online response. It's really sad, but I reckon the fact that we're all talking about how disgusting it is has actually prompted people to go & buy it out of sheer morbid curiosity. We've played right into their hands and probably lined their pockets as a result :( but nevertheless, it's so awesome to see so many people objecting to it. Again, cheers for writing about this. I'll be following you now for sure! This article sends out all the wrong messages and vibes to their readers, what a shame that a reputable magazine has glamourised being thin, not eating, exercising to the extreme etc etc. Your response is excellent and I whole heatedly agree with what you have said. I'm now sharing this and following your blog. This made me feel sick. Not only is it harmful to young people but also to those who have had an eating disorder. Articles like these can cause sufferers to relapse. The whole article stinks of pro-eating disorder. I cant believe a magazine could put something like that! No wonder there are so many young girls out there thinking that they need to stop eating to lose weight. Company really need to think about what they are putting next time. I'm actually in shock. Company has always been one of my favourite magazines but this article has radically changed my views. I just don't understand how on earth it made it to print?! My best friend went through and is still in recovery from anorexia and the fact that she could have picked up this hugely popular magazine and read this ridiculous 'skinny advice' is revolting.